Performance with 8 channel sound installation as part of the exhibition "Between One Time and Another"
Rana Hamadeh’s 50-minute sound play "Can You Pull In an Actor With a Fishhook or Tie Down His Tongue With a Rope?" (2015/2016) comprises of an 8-channel immersive and cacophonous sound installation accompanied by a discordant, continuously running, script. The sound decodes, re-orders and re-choreographs the affects that constitute the Ashura ritual - a ten-day Shiite ceremony that re-enacts/re-witnesses every year the historical slaying of Imam al Hussein (626-80 AD), a highly regarded political and religious figure for Shiite Muslims and an allegorical reference to the ultimate figure of the oppressed. Looking at the configurations of power constituting the Syrian-Lebanese political weave, this sound play re-dramatizes the logics under which the militant theatre of Ashura has been transformed in recent years into a militarized form of theatre. Rana Hamdeh (born 1983 in Beirut, Lebanon) is artist and lives and works in Rotterdam. 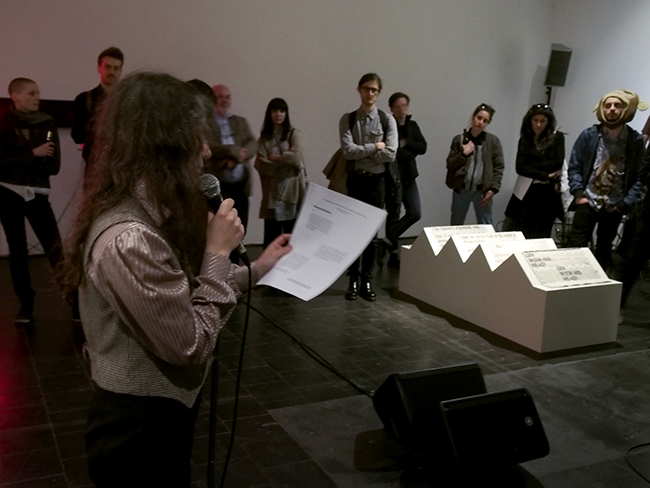 The performance has been shown in 2015 among others at the 6th Moscow Biennial, KW Institute for Contemporary Art, Berlin, and Western Front, Vancouver.